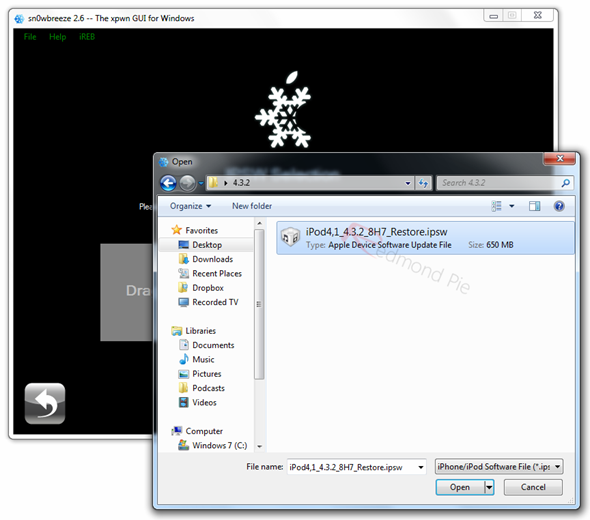 iPhone developer iH8sn0w has just released Sn0wbreeze 2.6 for Windows users to fully jailbreak iOS 4.3.2 untethered running on iPhone 4, 3GS, iPad (1st-gen) and iPod touch. Just like Redsn0w, iPad 2 jailbreak on 4.3.2 is not supported yet. Why use Sn0wbreeze over Redsn0w? If your iPhone relies on a carrier unlock, you must use Sn0wbreeze 2.6 which will help retain the old baseband for iPhone 4 and 3GS users so that they can be unlocked using Ultrasn0w. Complete step by step instructions for jailbreaking using Redsn0w on both Windows and Mac can be found here. iOS 4.3.2 was originally jailbroken last week using PwnageTool bundles (on Mac) but it was limited to tethered boot. But now with the new version of Redsn0w and Sn0wbreeze, you can jailbreak your iPhone, iPad, and iPod touch fully untethered on the latest iOS 4.3.2 firmware. Download and install iTunes 10.2.2 for Windows. Download Sn0wbreeze 2.6 for Windows. Download iOS 4.3.2 for iPhone, iPad or iPod touch. Step 2: Start Sn0wbreeze, click the next “blue” colored arrow to proceed. Step 3: Select the required firmware .ipsw file for your iOS device by clicking on the “Browse” button. Step 4: Sn0wbreeze will now identify the selected IPSW file. Once done, click the next “blue” colored arrow to proceed. 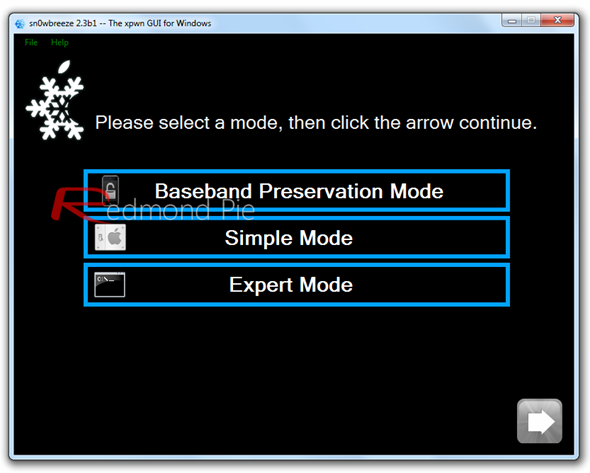 Step 5: Now select the “Expert Mode”, followed by “Build IPSW” option to start creating your custom firmware. Since building custom firmware may take some time, you can optionally play Pac-Man game to kill some time. Step 6: Sn0wbreeze will greet you with the following “Done!” message when the custom firmware has been successfully created. Step 8: Start iTunes, click on your iOS device icon from the sidebar in iTunes. Now press and hold Left “Shift” button on the keyboard and then click on “Restore” (Not “Update” or “Check for Update”) button in iTunes and then release this button. This will make iTunes prompt you to select the location for your custom firmware 4.3.2 file. Select the required custom .ipsw file that you created above, and click on “Open”. Step 9: Now sit back and enjoy as iTunes does the rest for you. This will involve a series of automated steps. Be patient at this stage and don’t do anything silly. Just wait while iTunes installs the new firmware 4.3.2 on your iOS device. Your iOS device screen at this point will be showing a progress bar indicating installation progress. After the installation is done, your iOS device will be jailbroken on iOS 4.3.2. Ultrasn0w 1.2.1 is currently said to be broken on iOS 4.3.2. You can temporarily use Ultrasn0w Fixer for 4.3.2 (compatible basebands: 01.59.00 / 04.26.08 / 05.11.07 / 05.12.01 / 05.13.04 / 06.15.00) to unlock your iPhone 4 and 3GS, step by step instructions for which can be found here. You can follow us on Twitter or join our Facebook fanpage to keep yourself updated on all the latest iPhone jailbreaking and unlocking releases.